I am headed to NY as I post. Check back for updates throughout the day. Heading to the keynote there was a DJ in the atrium of the Jacob Javits Center playing techno music wearing a shirt that said I Cloud NY. Nice addition. 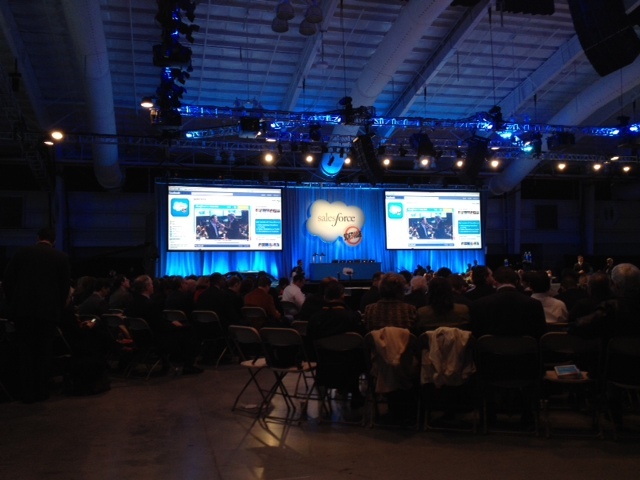 We are waiting for the keynote to start - so far there was a video touting the importance of social - including Twitter. then an interview with Comcast and Facebook execs. Keynote starts with Metallica Enter Sandman - with an accompanying video of catchy buzzwords - cloud - post PC, etc. Marc Benioff takes the stage: We were born cloud at Salesforce.com and we were reborn social. Facebook is easting the web - 23% of the time on web is social. Mobile minutes per day is higher than on PCs. A persistent part of how we do work each day. Next year we will exceed $3B annual run rate. Forbes said we were the #1, most innovative company - thank you. Marc goes through the innovation in the computing industry from the mainframe to the PC where Marc says Microsoft tried to stop innovation. Now he says we are in a new era thanks to the Google founders and Steve Jobs. Weird though with the Apple model of a "closed" app store, wasn't/isn't Microsoft far more open? Marc mentions occupy Wall Street - asks if we have heard of it - out of a room with about 4-5 thousand people just one member of the press started to applaud and abruptly stopped. Benioff then went through companies like BOFA and Netflix where customers have used social media to change companies actions like price and name changes, etc. You need to embrace social media he continued. Beware of the "false cloud" Benioff says - all the words are getting applied to new proprietary mainframes. "If you are upgrading and maintaining your cloud, you aren't in the cloud - if you are installing hardware, you aren't in the cloud," he continued. Customer testimonial video from Burberry about why companies need to create a social enterprise or "I don't know what your business model is in 5 years." Burberry CEO Angela Ahrendts takes stage to discuss how critical it is that companies become social "Facebook for Burberry." We cant expect younger customers who are digital natives to turn off when they come to Burberry. We have to change for them. New UI at touch.salesforce.com. Brief demo of how it looks - our rebuilding of our HTML interface to HTML5. Interesting app discussion with Infor who is developing software with Salesforce which allows hotels to tap into Facebook profiles to ensure when you check in the right music plays in your room, and other customizations which can be done to your stay based upon your profile info, etc.